We did not get out on the water this weekend. While it was not too hot to paddle, it was certainly too hot to load the yaks and gear. 100 degrees is definitely above my limit. Small children were bursting into flames as they tried to get to the ice cream truck. Whew! We really love our touring boats, both at 14 feet. But I occasionally regret selling our rec yaks for the occasional paddles in tighter creeks or drifts down rivers that have numerous shallows where I would not want to drag bottom in a higher-dollar boat. I would probably have made the effort to throw the lighter yaks on top this weekend in spite of the heat if we still had them. I made a big boo-boo in selling them to offset some of the cost for the new ones. Learn from my mistake friends, you need multiple types of kayaks. Well. I could not let the turtle/alligator question go (May 27). I’ve done a lot of reading and looked at a lot of pictures to convince myself that I saw the shell of a turtle, not the back of an alligator, sinking into the darkness. North Carolina’s Outer Banks are well within the northernmost habitats of the American Alligator and even though reportedly intolerant of saltwater in general, they will move through brackish water while relocating and take up temporary residence if food is plentiful. Although I am certain that everything I read on the web is true, I called the Museum of Natural Science in Raleigh, NC and spoke with Adrian Cull. He confirmed my information and referred me to biologist Dennis Stewart with the US Fish and Wildlife Service. Working at the Alligator River National Wildlife Refuge in Manteo, NC, Dennis listened to my story with complete non-surprise. He told me that they have removed alligators from as far north as the Albemarle Sound which is considered outside of their normal range. While they regularly get reports of alligators in the fresh water pools around the Cape Hatteras lighthouse, he said reports from sound-side marshes are infrequent but increasing. He once personally saw one in the ocean surf in Buxton! So much for the salinity issue. He is of the opinion that global warming, whatever the reason, is causing population shifts and alligators are just following the food (remember the nutria?). Tam calls it the “Need for feed.” A critter may not like the water or the area, but they like eating more. Of course, if it swims or floats in front of their mouths, it’s mealtime. So, I saw something in the water and the educated side of my brain knew that alligators were fresh water animals. Trying to match something up, it pulled “turtle” out of the files. 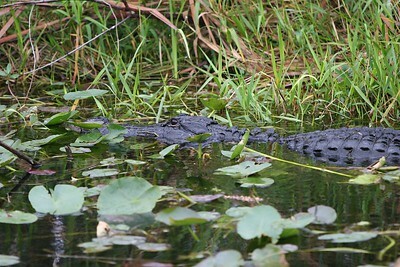 Even though the water was dark with tannin, what I remember seeing fits “back of alligator” better then “turtle shell.” I’ve seen them before on a paddle through the refuge and, although I will never be one hundred percent certain, I am going to chalk it up to Alligator mississippiensis. That’s my story folks, and I’m sticking to it. It’s a way to slow down. We have become a society where technology, pop culture and advertising have trained us to expect instant gratification. People can’t walk down the street without a cell phone glued to their ear. They can’t drive a block away from the house before succumbing to the need to call someone. Kids don’t talk face-to-face or look you in the eye because they are too busy text messaging. Waiting on regular mail is unheard of – fax, email, express mail, same day delivery, instant message. Now, now, now! When I am in a kayak, I want to move only slightly faster than the current so I have a bit of control. I want to actually feel my torso rotating forward to plant the blade for the next stroke. I want to feel myself unwind and the paddle coax me forward then pause momentarily to enjoy feeling my kayak glide through the water. I want to move slowly enough to allow myself to really experience all that I am traveling through – the byways of wilderness rivers or the twists and turns of a creek that is inaccessible by road. I want to move quietly, so that I do not startle the wildlife. I want to truly feel what is going on around me. I marvel at the first firefly at dusk, a lone bird skimming the water at sunrise, the small snake that makes several laps around me before moving on. Here, my bow parts the mist and opens the curtains of morning. There, a single blossom hangs from a long stem offering me a drop of dew. I sneak amongst the forests and marshes hearing the sounds of loons, owls and foxes like I have not heard them since I was a child. Frogs argue amongst themselves and trees sigh in a slight breeze. The sand hisses quietly as I beach for lunch and wonder what really made those tiny tracks at the shoreline. It is an amazing shift of perspective to sit only inches above the water. I find a whole-body contentment that brings me into the present moment to appreciate the watery unknown that waits ahead. Rain starts… and I smile. We took our season-opener last week during a vacation to Cape Hatteras, NC. The weather had not cooperated early on in the week, excessive winds put conditions beyond our comfort level, and we were excited to finally get out. After 5 months off the water we were a bit disorganized in the gear department, but were able to get going in about 20 minutes or so. We launched into the cool but comfortable waters of the Pamlico Sound at the west end of Frisco and began our travels east along the marshes. Moving through the clear water that was seldom more than two or three feet deep, we could easily see the grasses growing on the bottom and the creatures that lived there. Blue crabs, small fish, the occasional fluke and a small electric ray (Narcine brasiliensis) cruising across one of the many sandy areas. We continued paddle along the edge of the marsh, exploring small inlets and coves and came upon a very long canal leading into the grasses. Paddling quietly we were rewarded with a host of birdlife, and about half way in we interrupted a large swimming nutria. The canal lead to a dead end but remained deep throughout – impossible to see the bottom due to tannins. As we turned to leave I got the barest glimpse of a large turtle’s shell slowly sinking into the murk. We paddled back out of the creek at a leisurely pace, reached the sound and turned back west towards our launch site. There was a pair of yakkers coming towards us and we stopped briefly to exchange thoughts on the area then we went our separate ways. “A turtle in the canal?” I was starting to replay the scene, and my brain refused to let it go. Tam spent a bit of time with a very camera shy egret. She would give a small pull on the paddle and drift towards him while he would walk casually away at the same painfully slow pace, deftly moving to place tall grasses between them. After about half of an hour playing hide and seek, she was rewarded with several nice photos of a very handsome creature and we continued on. We returned to our leisurely pace home, seeing birds, more flukes, minnows and even a hermit crab. Did you know that, in the wild, hermit crab shells are not painted with day-glow paint? Who would have thought it? We passed several other paddlers including a couple on a tandem that was quietly arguing over who was paddling wrong and making the trip so difficult. Almost finished for the day, we caught sight of a black-bellied plover, uncommon to the Outer Banks and a nice finish to a great paddle. We had traveled about 5 miles at a comfortable pace, witnessed a beautiful ecosystem and once again enjoyed each other’s company.